Velkommen til Visioneers Norway! | Welcome to Visioneers Norway! Visioneers Norway is a voluntary organization created to promote Daniel Kish’s philosophy for the self-determination of blind and low-vision people in Norway. Daniel is blind, and through his work in the Visioneers | World Access For The Blind organization, he attaches particular importance to FlashSonar echolocation. We are very pleased to be able to represent Daniel Kish’s philosophy and teaching principles (Visioneering) for blind and partially sighted people in Norway. For almost two decades, Daniel has been a pioneer in this field and we are very proud that he wants to play an honorary central role in our organization. In addition to promoting Daniel’s vision, we want to provide funds for training a FlashSonar instructor in Norway, and organizing workshops for blind and sighted people of all ages who wish to learn the techniques. The emphasis is on self-directed freedom of movement for blind persons so that they can achieve greater independence to live as a contributing and achieving member of society. We’ll have more information for you in the coming weeks, and encourage you to follow us on Facebook by clicking on the module in the left column. While Daniel was in Norway, the NRK TV Network did a report on him and the launch of our organization. We have provided English subtitles, and an English transcript follows the video for our blind visitors. We hope you enjoy it and will support the work of Visioneers and Visioneers Norway. Click on the + sign to expand the English transcript for screenreaders. Host: He is blind, but with the help of clicking sounds and the echo it produces, he can create an image of his surroundings. Now he is teaching others. (Video of Daniel Kish teaching a young student in public areas between buildings). Host 1: Imagine that you are using your hearing to see. Daniel Kish has mastered this skill so well that he can ride a bike. Host 2: Now he is in Norway to teach others this unique technique. Reporter: He is creating a sound with his tongue and uses the echo to see. He cannot actually see with his eyes, but his brain interprets the sound he makes and changes them into images of his surroundings. Similar to a bat navigating in the dark, it is called echolocation. (Archive video from Visioneers | World Access For The Blind of Daniel with other blind cyclists). Reporter: Daniel Kish has mastered this to such a level that he can ride aa bike. (Back to video of Daniel working with his young student). Reporter: 3 year old Luca is Preben Mathieu-Bjerke’s son. Mathieu-Bjerke has taken the initiative to form a Norwegian organization that will promote this technique. The 3 year old uses echolocation somewhat already. Preben Mathieu-Bjerke: One of the main concepts is freedom of movement. That you can decide where and when you want to go also if you are blind. Reporter: Many blind individuals use echolocation already, but maybe not so actively as Kish, explains the Norwegian Association of the Blind. Arnt Holte: It is positive that someone promotes this. I also believe that many will benefit from this. Reporter: Thomas will train to become the first Norwegian instructor so that people here can learn this. Thomas: Now I can hear a car that is not making any noise. Before, I could only hear it when the engine was running. I don’t walk into parked cars any longer. 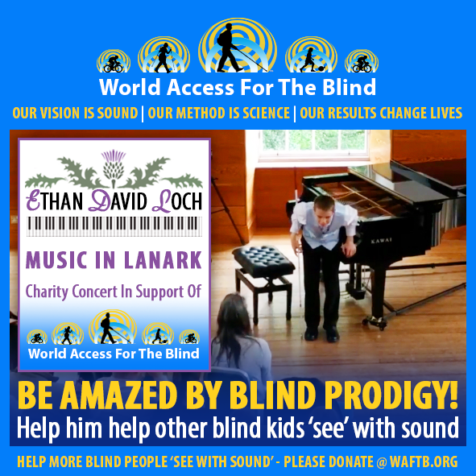 Ethan Loch lost his sight to meningitis shortly after his birth. Lead Visioneer Daniel Kish has been working with Ethan on his perception and mobility skills since he was a wee toddler in Canada, and in his native Scotland as he’s grown into a very talented and caring young man. Recently, Ethan, whose first language was music, blew the studio and home audience away with his appearance on “Little Big Shots UK” hosted by comedy icon Dawn French of “French and Saunders” and “The Vicar of Dibley” fame. Ethan also received a wonderful surprise from another comedy legend – Stephen Fry – who narrated the Harry Potter series of audiobooks. We’ve also been wowed by Ethan’s growing talent, and humbled by his generosity, as he held a charity concert at Lanark this year in support of our work. He even slogged through the muddiest McTuff Mud Run possible to raise funds so that other blind kids in Scotland can benefit from our FlashSonar instruction the way he has. Thank you so much, Ethan! And Congratulations on your well-deserved awards at the Vatican, the Chopin Festival in Poland, and the James Waterhouse Prize in London and his performance at Steinway Hall. A major part of these achievements is the wonderful support Ethan gets from his close-knit and loving family, including his Dad Fraser, and his first piano instructor – his Mum Larinda – herself, an accomplished concert pianist and Suzuki Method Instructor, his big brother Nathanael who fiercely slogged through the Mud Run with Ethan, even carrying him on his back after both his shoes got stuck in the mud, and little sister Hannah who’s always ready with the biggest hugs. And not to forget his supportive Uncle Dave and Aunt Alison and the rest of the clan. We’re so proud of you Ethan! All of us at Visioneers wish you many more musical successes in 2018! It’s not every day that the crowd goes wild for a late touchdown in a blowout football game. But one recent touchdown was a little different than most. “I’m just very confident of my ability, my speed, my power,” Watt said. He has a rare form of glaucoma which took his sight when he was 5. But it couldn’t temper his passion for the game. In the video below, watch Watt score two touchdowns against a a team that didn’t even know he was blind and read the full article at The CBS Evening News. The race is on between various tech companies to produce the ultimate assistive platforms and apps for users living with one or more disabilities. For blind and low-vision users, screenreaders that convert text to voice, including alternate-text descriptions of images, have opened a wealth of accessibility to apps, content, games, products and services. However, what limits the range of that accessibility at times has more to do whether accessible practices have been baked-in to the creation of these offerings, and that presents an ongoing challenge, especially in the mobile phone sector. Visioneers’ IT and Technology Consultant Chetan Bakhru, who has been blind since birth, recently dove into this digital landscape in his presentation at the CSUN Accessibility Conference in San Diego earlier this Spring, and digitally corralled the two biggest Operating Systems for a comparison showdown of their screen reading technology. Who won? Read on below, and you can learn more about Chetan’s tech credentials below the article. Both iOS and Android continue to get updates to accessibility features each year. People who are looking to acquire a new mobile device or people who already have a particular mobile device and are curious about what the other platform has to offer often ask which platform would be better for them. Ten years ago, the first iPhone had already been released but had no accessibility support whatsoever. Android also did not even exist back then, and when it first became available, it too did not have any accessibility support built-in. Many blind folks at that time were using phones that ran the Simbian or Windows Mobile operating systems with either the Mobile Speak or Talks screen readers. These solutions were very expensive as it required you to purchase the phone at a high price and then purchase the screen reader for around $400-500. Apple changed the game in a big way when it released VoiceOver for iOS in 2009 with the iPhone 3GS as the screen reader was built-in to the phone, and allowed one to interact with their phone using only a piece of glass (the device’s touch screen). Since then, Google has also added many accessibility features to Android, and both Apple and Google continue to improve their accessibility support when new major versions of their mobile operating systems are released each year. However, iPhones still have always been on the more expensive side, while Android devices can now be bought for less than a hundred dollars and can go all the way up to a thousand dollars depending on manufacturer, features offered etc. This gives the consumer great flexibility to choose the platform and device that meets their needs and that is within their budget. Both iOS and Android offer accessibility shortcuts to allow one to turn on the screen reader from anywhere. On iOS it is a triple-click of the home button (or the side button on iPhone 10), and on Android you hold down two fingers on the screen until you hear an audible prompt confirming that accessibility has been enabled. The iOS VoiceOver screen reader offers many multi-touch gestures while Android’s TalkBack only offers gestures that use no more than two fingers. Many of the gestures are angular gestures that many find difficult to perform as the software often interprets the vertical part of the gesture as a diagonal one. With all of today’s modern Android devices that support multi-touch, it baffles me that Google refuses to implement multi-touch gestures in TalkBack. Some argue that some older Android devices do not support multi-touch and therefore Google has stuck with two-finger gestures and angular gestures up until now, but at some point we need to move on from devices and versions of the operating system that are extremely outdated. iOS VoiceOver offers excelent Braille support, allowing one to customize all of the keys on their Braille display. Contracted Braille is supported, and Apple has finally ironed out many of the Braille-related bugs that have existed in iOS for a very long time in iOS 11. Android’s Braille support is far behind. Braille support on Android is provided through a service called BrailleBack, available in the Google Play store. However, contracted Braille is still not supported despite many requests to have this implemented. The latest beta version of BrailleBack contains some support for contracted Braille, but the only way to gain access to this version of the service is to subscribe to the Eyes Free mailing list, which makes it difficult for most blind people to get access to this technology since not everyone will want to (or knows how to) subscribe to a new list. iOS contains excellent support for co-existance with multimedia apps, with VoiceOver’s audio ducking feature automatically lowering the volume of music or other sounds that are playing while the screen reader is speaking to make it easier for users to hear the audio from the screen reader. Unfortunately, Android’s support for this is hit and miss; it works in some apps and not in others. The TuneIn Radio app was demoed during the session. I attempted to play CNN radio, and the audio of the radio station was paused/cut out whenever TalkBack spoke. This is a deal-breaker for many since it can make it extremely difficult to efficiently take notes on something while listening to audio content. Google has been aware of this for a long time and has done nothing about it. Also, one of the most widely used features of iOS VoiceOver is its Magic Tap gesture, which allows you to instantly stop/start audio from anywhere on your device, even if you are not in the app that is currently playing audio by performing a two-finger double-tap. TalkBack has no such gesture, which makes it time-consuming to stop the audio you have playing on your device. Keyboard Shortcuts: One of the strenghts of Android is that TalkBack lets you customize its keyboard shortcuts. iOS VoiceOver does allow control of your device and the screen reader via a Bluetooth keyboard, but you are stuck with whatever commands Apple provides out of the box; you cannot customize any of these shortcuts. In one way this is a good thing. If you are a trainer, you might not want your clients to change around their keyboard shortcuts, but from the end-user perspective, Android is the better choice if you are looking for the ability to customize keyboard shortcuts. Automatic Language Switching on Web Pages: iOS VoiceOver can automatically switch synthesizers/voices to a different language when the screen reader detects the appropriate language tags in HTML web pages. TalkBack does not currently support automatic language switching. TalkBack does allow you to manually switch your synthesizer language, but this adds an extra step that you have to carry out. If you want something that just works in this area then iOS is the winner here. I then went through a demo of several different HTML elements on a web page with both screen readers so that the audience could get a sense for which elements each screen reader worked well with. In summary, TalkBack works quite well with simple data tables, forms, headings, collapsing/expanding menus, tab pannels and an assertive ARIA live region. Unfortunately, it does not support fieldsets and legends to group form fields together, automatic language switching is not supported, and polite ARIA live regions do not work well at this time. VoiceOver on iOS has great support for all of the elements/components just mentioned. In conclusion, which screen reader is better for someone really depends on what the customer is looking for. If you want something that is very stable, supports multi-touch gestures, has great co-existance with multi-media apps, has excellent Braille support, supports the automatic switching of languages on web pages when the appropriate HTML tags are present, and has great support for most HTML elements and ARIA, then go with iOS. If you are someone who loves to tinker with your device and customize/personalize it quite heavily, and/or if you like to geek out and do not mind the accessibility limitations/bugs present in Android, and/or if you simply cannot shell out the cash for an iOS device, then go with Android. In my opinion, iOS is the winner here due to the fact that it is easy to use, is stable and just works, has excellent Braille support, has the Magic Tap gesture, automatically switches languages, and much, much more. ABOUT CHETAN BAKHRU, MSEng., PMP. Chetan holds a Masters Degree in Software Engineering from Penn State University, and is PMP (Project Management Professional) Certified. He is currently the Senior Accessibility Specialist with JP Morgan Chase & Co., and for more than 8 years, has been the IT Consultant for Visioneers | World Access For The Blind. He is a popular presenter at the annual CSUN Accessibility Conference, and while with SSB Bart Group as an Assistive Technology tester, Chetan co-authored a Powerpoint presentation on “Creating Accessible Content in Microsoft Office 2010“. Blind since birth, Chetan does have some light perception. You can learn more about his accomplishments at his Linked-in page, and you can hear him describe his experiences of living with blindness on the Fedora Outlier podcast. Did you know that in some countries, children born blind aren’t allowed to use a navigation cane until around the ages of 7 or 8? And that includes so-called “developed” countries. Do you even realize how much precious opportunity is lost in that time? That’s part of the reason blind children are sometimes slower to develop language skills and other social-development skills than their sighted peers. There are no valid reasons for this to happen, and it’s usually the result of outdated thinking or individuals and/or organizations being territorial about their “dominion”. Learn more about Lead Visioneer Daniel Kish’s pioneering research and development related to the benefits of Early Childhood Education on our Personal Visioneering page. Another factor in the importance of cane use is the acceptance of it, especially by sighted persons who become blind. There is a widespread stigma attached to it, and the reasons seem to be pretty common. We came across a post by “Girl Gone Blind” blogger Maria Johnson, that addresses this very issue. Maria has also collected other viewpoints on the white cane from other blind bloggers such as Eric J. Harvey, Sassy Wyatt, and Stephanae McCoy. Lead Visioneer Daniel Kish can relate to the issues each of those persons raise in their blogs, and you can read his take on it at our Facebook Page, and check out some related articles below. Reports a new way, based in perceptual theory and long practice, to determine cane length that is found to be especially helpful for children. is discussed, and some principals of implementation are outlined. An invited article by Daniel Kish about how we teach FlashSonar to bring mobility to new levels. There are fascinating updated results from the study that WAFTB President and Lead Visioneer Daniel Kish has been co-authoring with Dr. Lore Thaler and others via Durham University in Great Britain. They may not be that surprising to Daniel and other blind people that we’ve taught our FlashSonar specialized form of echolocation to. Daniel and some of our Instructor Visioneers have been working with Dr. Thaler on echolocation studies for a number of years, including her originating work as part of the team under the guidance of Distinguished Professor Melvyn A. Goodale at Western University in Canada. The results of their latest work have been published in the Journal Proceedings of the Royal Society B Biological Sciences. The Royal Society is a fellowship of many of the world’s most eminent scientists and is the oldest scientific academy in continuous existence. Quoting from the Abstract of the latest study results, “In bats it has been shown that they adjust their emissions to situational demands. Here we report similar findings for human echolocation. We asked eight blind expert echolocators to detect reflectors positioned at various azimuth angles. You can read more detail from the abstract on its page at the Royal Society Website. The research is providing further validation of the pioneering work Daniel Kish has been doing for decades in teaching his specialized form of echolocation – FlashSonar™. Read our Special Report on the study. China Global Television Network‘s program ‘Full Frame‘ reported the release of the latest Study Results from Durham University and used the occasion to debut their video report ‘Clicking A Path’. CGTN: Full Frame: “Echolocation” is a technique used by some blind people to navigate their world. The technique involves producing “clicking” noises with the tongue that bounce off objects in the environment and helps the visually-impaired create a mental image of where these objects are located. It’s the same “sonar” technique that is used in nature by bats, dolphins and porpoises to navigate a path. A new study recently published in the journal Proceedings of the Royal Society B: Biological Sciences, found that blind people who have mastered echolocation can identify objects with a high rate of accuracy by listening for echoes of their mouth clicks and that they subconsciously make subtle changes to their clicking patterns depending on the object’s location. Learn more about FlashSonar Echolocation by previewing and ordering a textbook co-authored by Daniel Kish. A study has revealed secrets that help some blind people navigate their world by “seeing with sound”. People who use “echolocation” employ it in a very similar way to bats – producing clicks that bounce off objects and “sonify” them into a picture of the surroundings. A study of experts in the technique has revealed how louder clicks allow “echolocators” to see behind them. The insights are published in the Royal Society journal Proceedings B. Most people who are born blind are highly sensitive to the acoustics of their environment – using the echoes that bounce of objects, walls and buildings to navigate and avoid collisions. However, in recent years there has been a growing awareness of the ability of some blind individuals to use mouth clicks to actively echolocate. Specifically, the researchers wanted to find out how echolocators adjust their clicks in response to variations in their surroundings to create complex “mental maps”. To this end, they enlisted eight blind expert echolocators to have their abilities put to the test. “Just from walking around with people who echolocate, I know anecdotally that this is a very flexible behaviour – so sometimes they are soft, sometimes louder,” Dr Thaler told The Independent. Blasted in the face at close range by a terrorist’s shotgun in Iraq when he was just two years-old, Humoody Smith’s life has been an ongoing chronicle of triumph over tragedy. Blinded by the attack, Humoody was eight years-old when we started working with him and we’ve borne witness to the incredible young man he’s maturing into – much of that, the guiding result of his supportive and loving adoptive family, (our Donors of The Year for 2016), and much of it a phenomenal internal spirit. No pity needed for this guy. He recently turned 15 and is going stronger than ever! Friday spotlight on 2017 #AshokaFellow Daniel Kish of World Access for the Blind. Daniel has created a new model of perceptual navigation training which may be the most disruptive innovation since the guide dog. As a child, Daniel realized (and has since scientifically proven) that by producing a clicking sound with his tongue and using its echoes to “echolocate”. Read more at our Facebook Page. Facebook compiled a reel of of special moments from the activities of World Access For The Blind, and later, Visioneers in 2017. It highlighted the third round of training with The Foundation For The Blind in Thailand where our trainee Visioneers earned Instructor Certificates at various rankings. It also captured some images with our students in the U.K., as well as the USA. Click on the thumbnail to play the video and click the Sound icon for audio. World Access For The Blind has been proud to be a research partner with Durham University in the U.K. as one of the many projects we participate in. It wasn’t long after the most recent study results were released that they ended up topping the New Reddit Journal of Science Forum. We’re always happy to hear from our current and former students on how they’re doing, and on what a positive difference learning FlashSonar™ Echolocation is making in their life. So it is with Kevin Lowe. He’s a survivor of some tough circumstances, but he’s making the most of what he’s learned, as profiled in Plantation Living Magazine. Read more at our Facebook page. Our pitch phrase is ‘Our Vision Is Sound | Our Method Is Science | Our Results Change Lives’. Today, we’re focusing on the Science as we mark the release of a new study that World Access for the Blind has been a research partner in that looks at human echolocation in unprecedented detail. World Access for the Blind has been teaching blind persons to see with sound for over 16 years. We’ve been doing this long enough now that the inspiration is cascading across subsequent age groups, as is the ‘paying it forward’. Such is the case with our students: Jake, Humoody and Nava. World Access For The Blind student Humoody Smith was busy iast Spring participating in the 5th annual ‘In Their Shoes’ 5K event in Alexandria, Virginia for the Iraqi Children Foundation. An estimated 800k children have been orphaned over ten years of war and more than 1 million have been displaced by ISIS. Humoody himself was an early victim of the conflict after he and his Iraqi family were ambushed by insurgents. Humoody was blinded and suffered horrible wounds after being shot in the face for which he still undergoes corrective surgeries to this day. He was airlifted for treatment in the U.S. and eventually adopted by his American sponsor family headed up by Randy and Julie Robinett Smith (WAFTB’s DONORS OF THE YEAR for 2016). Humoody recently turned 15 (BELATED HAPPY BIRTHDAY HUMOODY!) and is now the long snapper and chief wisecracker for his school’s football team and is involved in many other sports and activities thanks to his incredible parents. World Access For The Blind has been proud to be a research partner with Durham University in the U.K. as one of the many Academic Research programs we participate in with Dr. Lore Thaler. Read more at our Facebook Page. WAFTB Editor’s Note: The article mentions that we can familiarize ourselves with and sketch an unfamiliar room, but fails to mention more complex outdoor environments where we can do the same. ‘This Is How Some Blind People Are Able To Echolocate Like Bats’ By Clare Wilson. New Scientist Magazine interviewed WAFTB President Daniel Kish about the new ‘Seeing With Sound‘ study that he participated in at Durham University. As one natural disaster followed the other, World Access For The Blind provided emergency information for disabled persons living independently and anyone who might be helping them to evacuate. Many people were following coverage of the storm on their mobile phones,so we tried to provide the most relevant information. We’ve archived the coverage of Hurricane Irma. If you are or know someone who is blind, low-vision, living with a disability or elderly and in need of help getting to safety, CALL 1-800-626-4959. Some news sites ands blogs are reporting that people with disabilities are being turned away from some shelters or being denied sign language interpreters. Daniel Kish, the lead Founder and President of World Access for the Blind is a ‘notable profile’ in the summer edition of Profitable Practice. It’s a magazine published for medical professionals in Canada and the United States, and you’ll often find a copy in the waiting area of your health care professional.